I grew up in the windy northern isles, and I do mean windy. My trademark windswept and interesting look was earned the hard way – no amount of hairspray in the world can keep you looking neat and tidy in 70mph winds, and trust me, I’ve road tested more than my fair share of brands. So it’s rather unfortunate that I have sensitive ears – the kind of ears that hurt when the music is too loud or feel as bad as toothache when gale-force winds come a-calling. 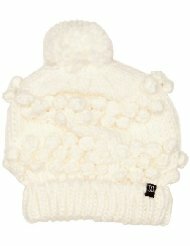 My youth was spent swathed in knitted hats, hoods, and when all else failed, ears stuffed with cotton wool. Over the years I’ve learned to love hats, and have found what works for me: top hats, baker’s caps, cossack hats (the bigger and fluffier the better); and what doesn’t: berets, beanies, cloche hats, the trilby, cowboy hats. What can I say – my small head with big hair needs a big hat. This season, new coat = new hat, and the hunt was on. I have a hat which compliments my dress coat or cape which I wear over suits. However, I have a new sensible weather proof coat this year – it’s windproof and I’m in love – and it’s winter white in colour. All I needed was an outdoorsy type hat to compliment it too. My folks gave me a beautiful cap as part of my Christmas, but I can’t wear it when it’s really windy as it’ll fly off into the yonder. And that’s part of the problem, when I wear it all I want to do is jump in puddles and fool around. It brings my inner child out into the open. It may not be elegant, it may not be cool, but it sure is fun and I don’t have to chase after it on a windy day. Like I said already, it’s hard to swagger while sporting a bobble hat.